In your travels on the internet, you may have come across videos of seemingly crazy crosswind landings, like the one seen in the clip below shot in Birmingham, Great Britain. The BHX airport is famed for its crosswind landing videos. AvGeeks regularly gather to shoot there on windy days. It looks terrifying — like a lot of those landings and takeoffs are perilously close to disaster — if not a very rough landing. Spoiler: They are not. And we’ll explain why. “I’ve seen these videos, and sometimes non-aviation friends will tag me in them,” said Shannon Pereira, a Boston-based first officer with JetBlue. “Nine times out of 10, we’re dealing with a crosswind,” she said, noting that it doesn’t matter if it’s a takeoff or a landing. “And passengers won’t notice. On approach, we are generally pointed in a different direction than perfectly parallel to the runway.” This technique is called “crabbing into the wind,” performed by using the foot pedals to deflect the rudder — which works much like a boat’s — and point the nose in the direction the rudder is deflected. Then, as they flare to land — raising the nose so that the main gear touches down first — the pilots will use the rudder again to align the plane with the runway’s centerline. It’s old hat for Pereira, who flies the Embraer E190. “Obviously, you want to avoid those side loads on the landing gear, but the aircraft can handle it,” she said. The video below shows the view from the flight deck for a landing at Paris CDG. (I suggest you turn the music down to zero). What’s amazing about this landing is the amount of action on the control column. The pilot is calm, but he’s also very focused on the physical task at hand. (You can see it in his face just prior to touchdown.) Pereira said that even though the control column will be moving this much, if you were watching it on the ground you wouldn’t see massive adjustments in the plane’s trajectory. Wind shear is a change in wind speed or direction (or both) over a short distance. It can occur either horizontally or vertically and is most often associated with temperature inversions near the ground, strong surface winds, thunderstorms and rain showers. Wind shear on final approach is typically vertical wind shear. It’s flagged for pilots by air traffic control, which has a low-level wind shear alert system on the ground at the airport, other aircraft and in automatic local weather reports for pilots. And it is relatively common. In the typical scenario with wind shear, the wind will suddenly drop off in speed, by as much as 30 knots. The plane’s airspeed is measured by its speed relative to the wind, so losing 15 to 30 knots — up to 35 mph — in an instant is not pleasant. When it happens, it can feel like the bottom of the plane falls out from you. “Wind shear makes a big difference at 100 feet,” Pereira said. “Where we know there is wind shear we’ll change the power settings to add more power and less flaps, and come in at a higher speed,” she said. Since 1993, all US commercial aircraft are required to have a wind shear alert system installed, stemming from incidents related to a phenomena called microbursts. 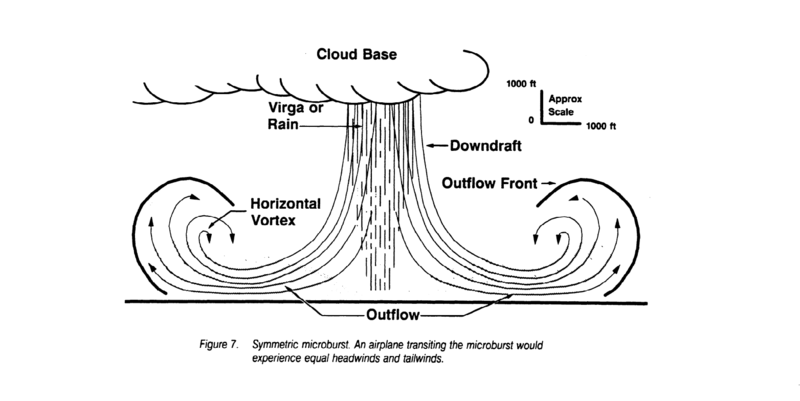 Microbursts are particularly dangerous concentrated downdrafts of air and have been the cause of numerous air disasters. In a microburst, a column of wind will descend rapidly over a small surface area, then hit the ground and push outward. The outward push causes a temporary increase in wind speed. But just as quickly, a plane passing through a microburst will hit a downward, violent and constant blast of wind, followed by a tailwind on the way out of the microburst. The consequence can be a loss of control of the aircraft. Fortunately, pilots and ATC work closely to avoid this possibility when landing, giving pilots time to anticipate and extricate themselves from problems. That’s just what it sounds like: pilots can decide to stop the approach to landing and go around if they feel that conditions are unsafe. “We do a lot of training in the simulators. When the time comes to go around, we’re not shy,” said Pereira. “We’d like to land the first time, but there will be good reasons to go around,” she said. Reasons include the aforementioned wind shear and microbursts, but also because of traffic on the runway or so-called “unstable” approaches, such as where the plane may be too high to descend at a reasonable rate. Go-arounds are ultimately a safety measure and not a cause for passenger concern. “The captain has the final call on the go-around. The pilot flying should initiate the call. However, if the first officer is flying and the captain believes the situation unsafe or unstable he or she can call for the go-around and it must be initiated. Once a go-around is initiated you can’t abort it,” Pereira explained. To make it easier, aircraft have “TO/GA” buttons on the throttles. Hitting the TO/GA switch — it stands for Take Off / Go Around — immediately increases engine power, allowing for a fast exit from whatever situation prompted the go-around.